Living London was light, fun, and very entertaining. 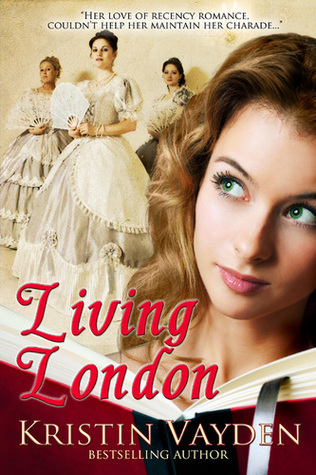 Jocelyn thinks of herself as an expert in Regency, until she finds herself trying to live it. The etiquette lessons and countless changes of clothes for various affairs (which all include the dreaded corset) weren't what she expected. Through the whole experience Jocelyn finds a handful of close friends that are willing to guide her through the many pitfalls of London's ton. With a romantic lovestory flowing gently along until it causes a huge scandal that leaves society shocked and thrilled at the juicy gossip. While this wasn't the most memorable read of the year, it was one of the most fun. There was a lot of substance for an almost novella (just a little longer), but it was a little too happy go lucky for me to give too many more stars. I do like a little more drama.